I have two watercoloured cards to share today. I made them using stamp sets from Taylored Expressions Feburary release. 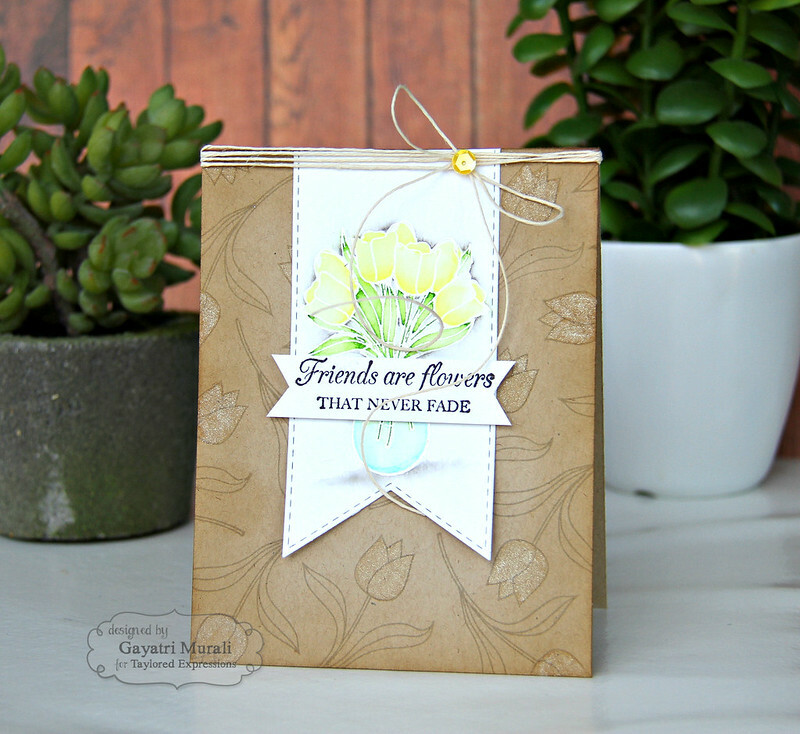 The first card features Wildflower Bouquet stamp set. This bouquet is perfect for colouring. The sentiments are perfect for the image. Florals is a safe and versatile set to have in your collection. This set also has matching dies. The first thing that came to my mind seeing the bouquet is watercolouring. So on my card below I heat embossed the bouquet and watercoloured the image using Zig Clean Brush watercolour pen. I tossed between black or white heat embossing initially. Then decided to white heat emboss because I wanted image to look softer and elegant. The paper I used is Tim Holtz distress watercolor paper on the smooth side. I then coloured the image using Zig Clean Brush watercolour pens. I dabbed a little color on the place I wanted the shadow and then moved the colour using the aqua brush. This gives me a gradient of colour with highlights and shadows. I added grey on the outline of the image. This makes the image pop. I then die cut the coloured panel using the second largest die from Stitched Rectangle Stacklets. I also die cut kraft cardstock using the largest die from the Stitched Rectangle Stacklets and layered under the coloured panel. I then wrapped around some natural twine and tied a bow. I adhered this layered panels on the white cardbase. 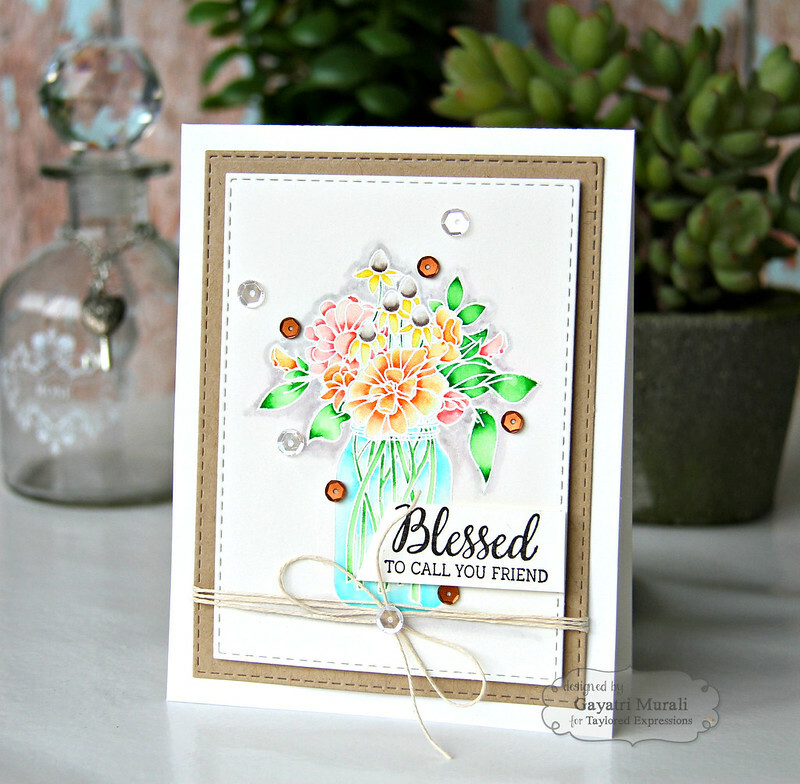 The sentiment is also from Wildflower Bouquet stamp set, Finally embellished with sequins from Taylored Expressions Wedding collection. 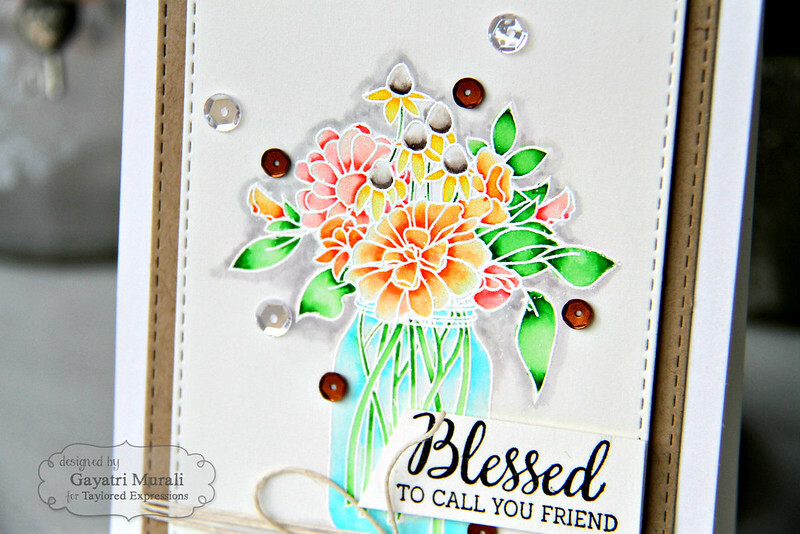 The second card is similarly watercoloured using Spring Tulips stamp set. This set also has coordinating die. I white heat embossed the image on Tim Holtz distress watercolor paper and coloured using Zig Clean Brush pens. I did the exact same process of colouring as the previous card. Then I used the second largest die from Stitched Banner Stacklet to die cut a banner. On a kraft card front, I stamped the tulip flower image using Kraft ink. I love tone on tone stamping. Then sponged the front edges with Frayed Burlap distress ink and brushed clear Wink of Stella shimmer on the tulip flowers. Then I adhered the die cut banner with watercoloured image on the top centre of the card front. Wrapped natural twine around the top of the card base and made a bow. 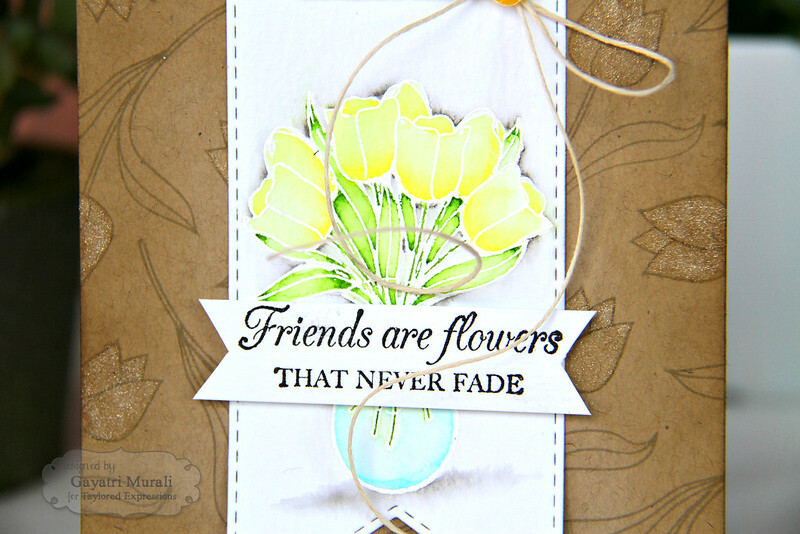 The sentiment is from the Spring Tulip stamp set is stamped on a strip of white cardstock trimmed with fish tail banner. On this card I just added a single yellow sequins to the bow. Both the stamp sets and dies along with many new stamp sets and dies released this February are available for purchase at Taylored Expressions Store. Both of your cards are gorgeous!! The watercoloring effect is amazing!! Beautiful cards!! Love the coloring on the white embossed images! !